President Donald Trump weighed in on the battle over counting ballots in Florida's Senate and governor's race Monday and, as he has done before, claimed without evidence that the integrity of the election had been compromised. The president tweeted that the results from Election Night should be accepted and both Republican candidates, Gov. 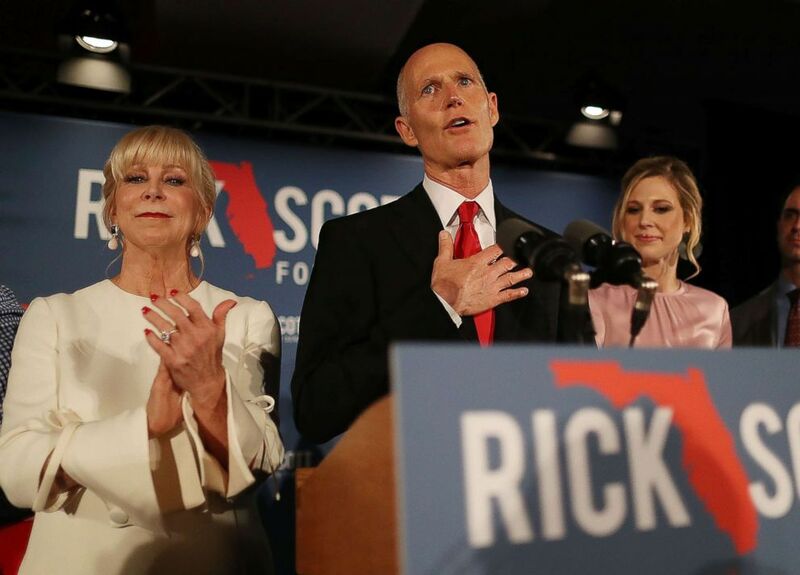 Rick Scott, who's running for U.S. Senate against Sen. Bill Nelson, and former Rep. Ron DeSantis, who's running for governor against Tallahassee Mayor Andrew Gillum, should be declared the winners of their respective races. But the president's desire to use results from Election Night, which he tweeted on Veterans Day, would disenfranchise many voters whose ballots are counted after Election Day, including voters serving overseas in the military. Overseas and military ballots can arrive until Nov. 16 and will be counted, as long as they're postmarked on or before Election Day. Additionally, there is no evidence that ballots "showed up out of nowhere," but rather ballots continued to be counted days after the election -- largely mail-in, absentee and provisional ballots in slow counties like Broward and Palm Beach, which lean Democrat. The Florida Department of Law Enforcement, or FDLE, has no open investigations into any claims of potential fraud, ABC News confirmed Sunday afternoon. Florida's Attorney General Pam Bondi, on the shortlist to become Trump's U.S. attorney general, wrote to the head of the FDLE over the weekend imploring that he pursue an investigation, citing reports that Broward Supervisor of Elections Brenda Snipes mixed 22 invalid ballots in with a batch of 205 provisional ballots submitted to the Florida secretary of state's office. Bondi called the FDLE Commissioner Rick Swearingen's decision not to investigate "wholly incompatible" with the allegations made. Florida Governor Rick Scott speaks during his election night party at the LaPlaya Beach &amp; Golf Resort on Nov. 06, 2018 in Naples, Fla. The president has made claims of improper election results before, most notably after the 2016 election, when he said there were more than three million illegal votes cast -- about the same number more votes Hillary Clinton received in the popular vote. However, his own voter fraud commission disbanded over the summer after many governors refused to cooperate and the group was unable to provide any evidence to back up that claim. Palm Beach and Broward counties have until Thursday at 3 p.m. to finish their recounts. County election officials expressed concern over the weekend that they wouldn’t be able to run more than 8.2 million ballots through the machines in time, but supervisors from both Palm Beach and Broward County later said they were on track to get it done. It’s not clear what might happen if the deadline is missed. According to Florida Secretary of State spokeswoman Sarah Revell, who said Florida state law doesn’t grant her office the power to extend recount deadlines, if a county doesn’t submit results by the deadline, the election results revert to the count from Election Day. In the race for U.S. Senate, Nelson is edging closer to Scott, who leads by just 0.15 percent, as of Monday morning. Both campaigns have launched lawsuits in what is becoming a messy déjà vu for Floridians who remember the 2000 election. The lawsuits on behalf Nelson aim to get more votes counted, and the lawsuits on behalf of Scott aim to ensure votes are being counted with accuracy. On Monday, Nelson’s campaign sued Secretary of State Ken Detzner, claiming that slow mail delivery delayed hundreds of thousands of mail-in ballots from being counted. According to Florida law, mail-in ballots must arrive by 7 p.m. on Election Day to be counted, but the lawsuit, on behalf of a veteran action fund and the two largest national Democratic committees, said over 870,000 ballots postmarked before Election Day hadn’t been “counted as returned” as of the Thursday after the election. 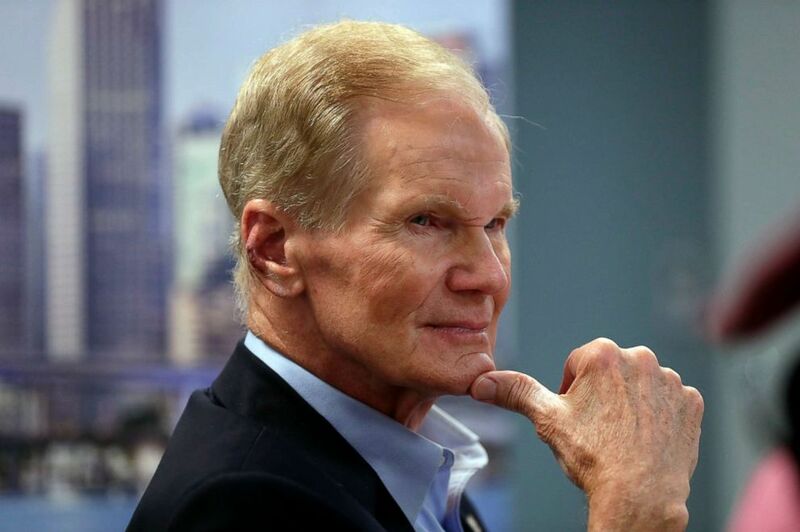 Sen. Bill Nelson listens during a roundtable discussion with education leaders from South Florida at the United Teachers of Dade headquarters in Miami, Aug. 6, 2018. “Voters should not be disenfranchised solely due to the speed of the post office’s delivery,” the lawsuit said. Nelson's campaign also recently sued over ballots thrown out for signature mismatches -- a law that requires election officials to check the signatures on mail-in and provisional ballots up against state records before accepting the vote. Scott's campaign filed a lawsuit of their own over the weekend, in addition to the lawsuit filed by his campaign last week which a judge ruled on in his favor, forcing Broward's election supervisor to disclose the total number of votes cast in Broward County. But the Scott campaign's request from over the weekend, which asked for law enforcement to impound ballots and counting equipment when not being used by Broward County to count and recount votes, was denied by a state judge Monday. Seventeenth Circuit Chief Judge Jack Tuter ruled that Scott’s team lacked evidence of misconduct by election officials —- which Scott’s team had alleged in its lawsuit —- to require law enforcement to step in. He did order, however, that additional security be provided during the ongoing recount. Three officers from the Broward County Sheriff’s Office will be assigned to the recount, Tuter ordered. Scott had filed a similar lawsuit against Palm Beach County on Sunday, though it was denied by a judge Tuesday. ABC News' Justin Fishel, James Hill, Chris Good and Stephanie Wash contributed to this report.